Groups in Red Hat Single Sign-On allow you to manage a common set of attributes and role mappings for a set of users. Users can be members of zero or more groups. 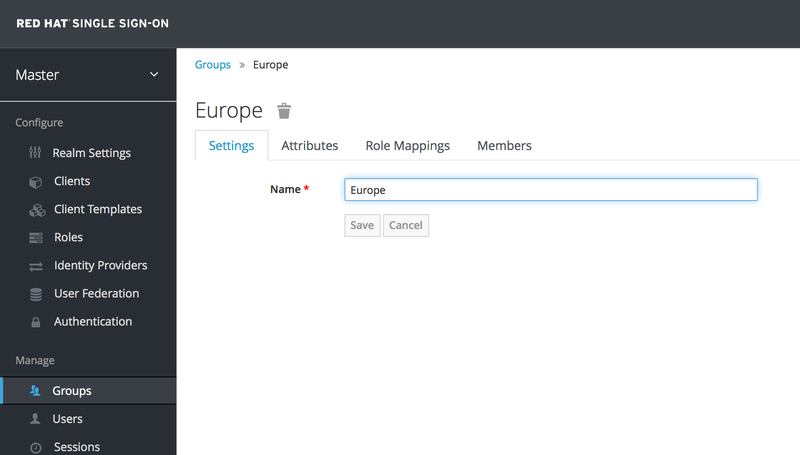 Users inherit the attributes and role mappings assigned to each group. To manage groups go to the Groups left menu item. Groups are hierarchical. A group can have many subgroups, but a group can only have one parent. Subgroups inherit the attributes and role mappings from the parent. This applies to the user as well. So, if you have a parent group and a child group and a user that only belongs to the child group, the user inherits the attributes and role mappings of both the parent and child. In this example, we have a top level Sales group and a child North America subgroup. To add a group, click on the parent you want to add a new child to and click New button. Select the Groups icon in the tree to make a top-level group. Entering in a group name in the Create Group screen and hitting Save will bring you to the individual group management page. The Attributes and Role Mappings tab work exactly as the tabs with similar names under a user. Any attributes and role mappings you define will be inherited by the groups and users that are members of this group. To add a user to a group you need to go all the way back to the user detail page and click on the Groups tab there. 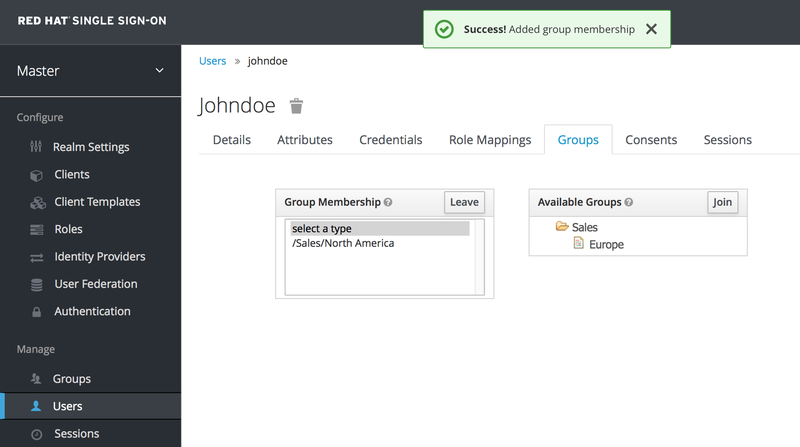 Select a group from the Available Groups tree and hit the join button to add the user to a group. Vice versa to remove a group. Here we’ve added the user Jim to the North America sales group. If you go back to the detail page for that group and select the Membership tab, Jim is now displayed there. Aren’t Composite Roles also similar to Groups? Logically they provide the same exact functionality, but the difference is conceptual. Composite roles should be used to apply the permission model to your set of services and applications. Groups should focus on collections of users and their roles in your organization. Use groups to manage users. Use composite roles to manage applications and services. Default groups allow you to automatically assign group membership whenever any new user is created or imported through Identity Brokering. 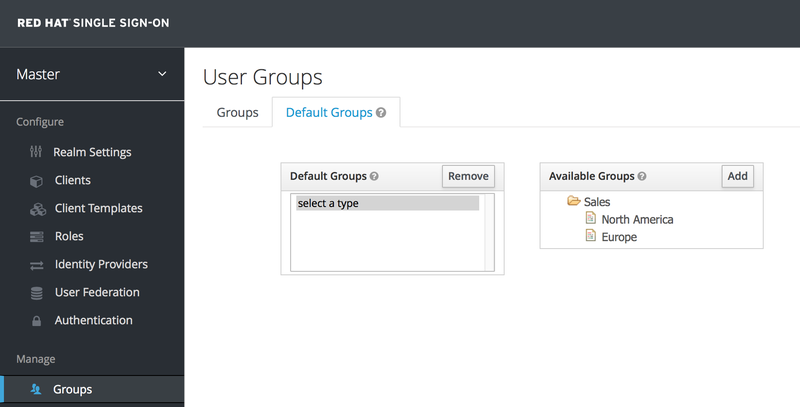 To specify default groups go to the Groups left menu item, and click the Default Groups tab.